The Indigenous peoples of the Sierra Nevada de Santa Martha in Colombia have a mission of utmost importance: to bring healing and balance to the earth for the benefit of all of humanity through their spiritual work of offerings and ceremony. They consider their land to be the heart of the world, contained by an invisible “Black Line”. Spanning the Sierra Nevada de Santa Martha to the Caribbean coast, their traditional territories include a variety of climates and ecosystems from snowy peaks, to cloud forest, tropical jungle and plains. They believe that, in each one of them, they can see a reflection of what is happening to our planet. In order to restore balance they must make “payments” or offerings, to the spiritual Mothers and Fathers at sacred sites along the Black Line. It is an intricate web of exchange where materials from one place are gathered and processed and then offered in another. This work is led by the Mamos, their elders and shamans, who are prepared from a young age in these sacred technologies. 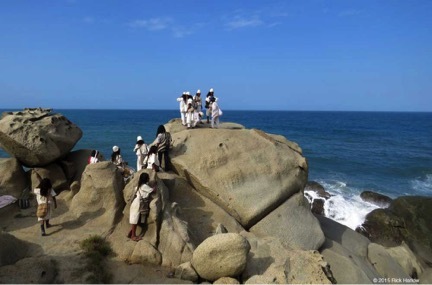 In December 2015, 22 Arhuaco and Wiwa Mamos, sagas and apprentices (plus 3 babies) set off on this extraordinary journey to make payments at 44 sacred sites with support from the Elders Project and funding from Sacred Fire Foundation. Making payments for all of humanity at the sacred site of Cañaveral. The Black Line Journey marks the first time the Wiwas have sent a full delegation to work with the Arhuacos in this way. Wiwa mamo and son. Very few of the traditional indigenous people have the opportunity to travel the Black Line to see the sacred sites first hand. Sacred site of “Volcano Totumo,” severely damaged by tourism. Deep water port under construction at Puerto Brisa, for the loading of coal onto large bulk freighters. There is a sacred site on the land where the port is, that is no longer accessible to the Mamos. Back in Arhuaco territory, processing materials gathered during the Black Line Journey that will be used to make new offerings. The materials are baptized, blessed and made into “payments” to be used for future traditional work. The Elders Project Director, Rick Harlow (4th from left) stands around the offerings with Arhuacos in the kankurwa (traditional village) of Manchukwa. These tributes are thought of as deposits in their spiritual bank to be withdrawn when needed to make “payments” at sacred sites anywhere from the snow capped peaks down to the Black Line. *All quotes are part of a letter written by the Arhuaco Mamos to the Sacred Fire Foundation. Please continue to support projects that nurture ancestral wisdom for the benefit of all of humanity by making a donation.